Both tents are quite near each other, lol, easy walking, can’t miss them, and each has totally different art/merchandise of mine, so definitely stop at both. I’m happy to autograph everything! Just a short walk by the lake at Epcot and you can hit both of the galleries’ tents, and I’d be happy to sign stuff for you! Admission to Epcot is required (this event is located INSIDE the park), no other special tickets needed, you just need to have admission to Epcot. Epcot is located at the Walt Disney World Resort in Florida. 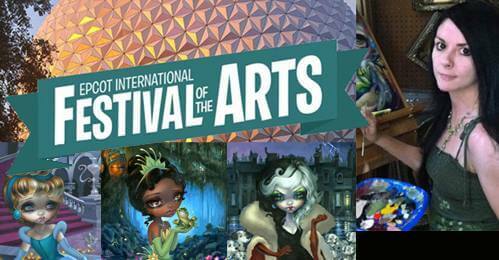 From Disney: We’re excited to announce a brand new event at Walt Disney World Resort: the Epcot International Festival of the Arts debuts Jan. 18 – Feb. 25. It’ll be a trifecta of global masterpieces: combining visual, culinary and performing arts for six colorful weeks. From historic showcases of Disney Icons like Mary Blair to current Disney artists such as Jasmine Becket-Griffith, you’ll not only be surrounded by incredible visions, you’ll watch the creative process live!